because of its limited carrying capacity is disconcerting, even shocking. More salmon returned from the Pacific Ocean and were counted crossing Bonneville Dam, 146 miles inland, on their way to spawn -- at hatcheries or in the wild -- in 2014 than in any year since 1938, when fish counting began there. The 2014 run was about 2.5 million fish, continuing the trend of big returns in the 21st Century compared to the 1990s. That's good news for people who fish and for the ecosystem, which benefits from the nutrients added to rivers by salmon that die after spawning. The big numbers, however, may portend less benefit for future generations of fish. That is because the productivity of naturally spawning salmon is decreasing due to a mechanism called "density dependence" that regulates the growth of populations. The detailed scientific evidence is explained in this report by the Independent Scientific Advisory Board (ISAB), a panel of 11 experts that advises the Council, the federal agency NOAA Fisheries, and Columbia River Basin Indian tribes. The ISAB report cites strong evidence that robust runs -- record-setting for the present day but still less than half their estimated historical abundance -- are exceeding habitat limits in some areas. These include limits on the types and amounts of available food, shelter from predators and competitors, and the ability to move to other suitable habitats when needed. Collectively, these limits, and others, define the "carrying capacity" of habitat. When carrying capacity is exceeded, salmon runs can collapse quickly to levels the habitat will support. Carrying capacity is an important part of the answer. 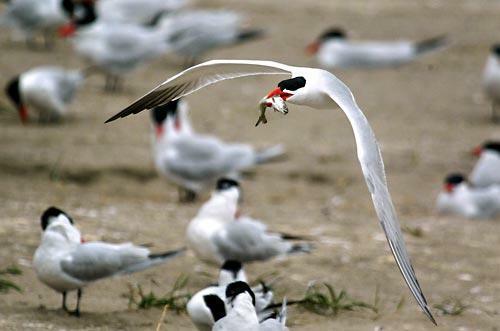 In a 2011 report on food webs in the Columbia River Basin ecosystem, the ISAB explored whether the Columbia River system can produce enough of the right food at the right times and places to maintain thriving populations of salmon and other native fishes. The ISAB concluded that changes to the basin's food webs are widespread and are affecting the aggregate carrying capacity of the river to produce fish. The effects of non-native species on the food supply and the proliferation of contaminants and chemicals in the Basin also are affecting the food supply. In its 2015 report, the ISAB points to a related impact on food webs and carrying capacity of fish habitat: "density dependence." This is the practical effect of changes in density -- the growth rate of a fish population fluctuates in response to the habitat carrying capacity at one or more critical life stages: spawning and rearing in streams, rivers, the estuary, and the ocean. Generally, a population's growth rate is highest at low density, because the food supply and habitat are adequate for the number of fish present. The growth rate decreases as density, and competition for food and space, increases. 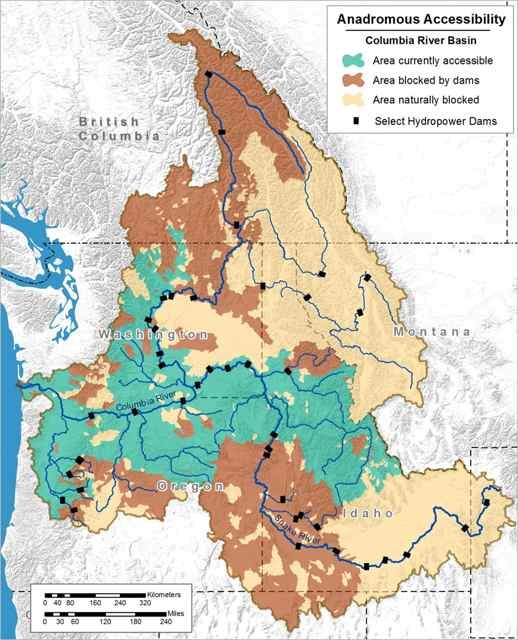 Thus, understanding density dependence is important for effective implementation of the Council's Columbia River Basin Fish and Wildlife Program, federal biological opinions and recovery plans for endangered and threatened species, and tribal programs. Understanding how density dependence limits fish population growth and habitat carrying capacity is vital for setting appropriate biological goals to aid in population recovery, sustain fisheries, and maintain a resilient ecosystem. To answer that question, the ISAB's report presents a new analysis of limited historical data on Columbia River salmon and steelhead run sizes. Results show that prior to development of hydroelectric dams, which today block access to about one-third of salmon habitat that once was available, the all-species carrying capacity of the basin was about 5 to 9 million adult fish per year, and probably closest to 6 million. That's a lot less than previously published estimates, which ranged from 7.5 to 16 million adult fish per year, or higher. So not only were there probably fewer fish in the basin historically than previously believed, but because so much of the basin no longer is accessible, the overall carrying capacity is much less today than in the past. As well, continuing changes to environmental conditions from climate change, chemicals, and intensified land use further diminish the capacity of habitat that remains accessible. These are the same problems impacting food webs, as cited in the ISAB's earlier report. In short, habitat capacity has greatly diminished over time. In the era before hatcheries, all fish were wild. But today, the habitat is shared with hatchery fish and numerous non-native species that have been introduced over time. In fact, according to a study cited by the ISAB, non-native fish species equal or outnumber native species in Washington, Oregon, and Idaho. Because hatchery fish account for a large proportion of current salmon abundance, high densities of hatchery smolts, natural smolts, and non-native species sharing the same habitat create unintended density effects that limit natural populations. Ironically, while hatcheries are capable of boosting runs that spawn naturally, this practice, called "supplementation," may be overwhelming the habitat in some areas. Balance hatchery production and releases with the basin's capacity to support existing natural populations. In sum, Columbia Basin ocean-going salmon and steelhead appear to reach limits to abundance at lower levels than in the past, owing to reduced ability of the habitat to support them. This is apparently because either habitat has been blocked, its quality reduced, or other fishes (non-natives and hatchery fish) have taken over. Management actions are needed that account for these limits and attempt to reduce some of them -- such actions include habitat restoration, passage improvement, and judicious harvest. Big Salmon Runs Today - What about the Future?